We were hit with the need to convert weight measurements today from pounds down to ounces. With out iPads, a couple of us hit Google to find a site. 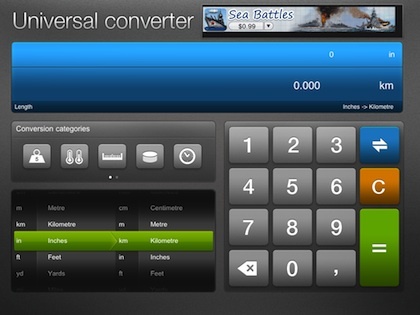 Almost as quick, one co-worker found and downloaded a free nice Converter app, Universal Converter HD. While the name says ‘universal’ it is not a “Universal” app that runs on both iPad and iPhone… the name is in reference to it’s power to convert across many different types of measurements. Universal Converter HD works in both Portrait and Landscape views. 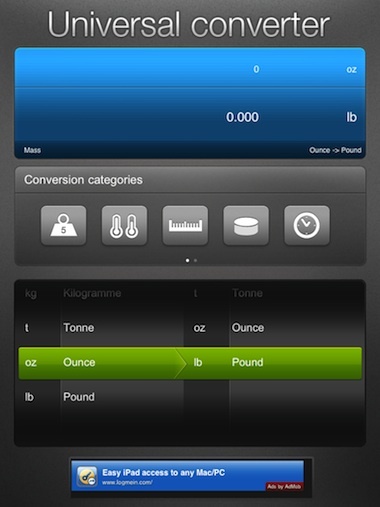 Launching the app, you are presented with icons to choose between the types of measurements. Then, two spinning lists of units that are within the measurement category. Options include: Mass (7 units), Computer measurements (8 units), Speed (7 units), Volume (13 units), Distance (8 units), Time (7 units) and Temperature (5 units). When you have the two units chosen to convert with, tap the upper ‘blue’ box areas to bring up the keyboard to enter your measurement numbers. In the landscape layout of Universal Converter HD, the keyboard is always available. As you may have noticed, the reason this Conversion App is free is because it does have ads showing on the screen when it is in use. 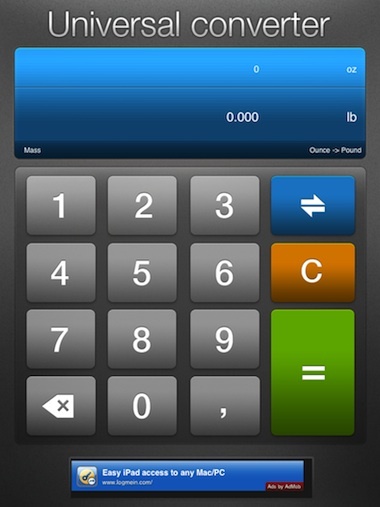 While we don’t mind when a developer uses this method to finance their app. We do like when the developer offers the in-app payment option to make the ads stop showing. This app does not have the option. The reason this can be important is when you use an app in front of a customer, you want to be able to control what may happen to pop up on the screen which you can’t do with the automated in-app ads. We’ll still leave Universal Converter HD on our iPads though.